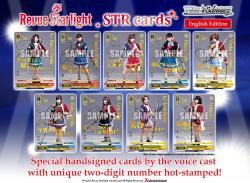 We would like to introduce the special STR rarity cards for Booster Pack Revue Starlight! These are special parallel cards that are hand-signed by the voice cast and have a completely unique two-digit numbering hot-stamped on the top left! There are no two alike in the world, and a very limited number of these STRs have been produced for each character! Fans of Revue Starlight and its voice cast will definitely not want to miss out on this! ※Not all two-digit numbers for each character will be available. This information can also be found in the image attached (which includes sample images of the STR rarity cards). We would greatly appreciate if you could share the above information with your retailers.